Fig. 17. Radial tunnel syndrome. Axial fat-suppressed, T2-weighted image at the level of the radial tuberosity demonstrates selective denervation edema of the supinator muscle (S). Fig. 18. 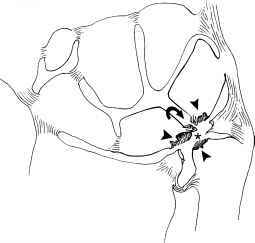 Posterior interosseous nerve syndrome. Axial T2-weighted image at the level of the radial tuberosity shows mild atrophy and diffuse interstitial hyperintensity of the supinator and extensor muscles with sparing of the extensor carpi radialis longus. ecu, extensor carpi ulnaris muscle; edc, extensor digitorum communis muscle; edm, extensor digiti minimi muscle; ecrb, extensor carpi radialis brevis muscle; ecrl, extensor carpi radialis longus muscle. 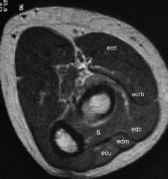 exerted by a thickened arcade of Frohse, thickened medial edge of the extensor carpi radialis brevis muscle, prominent recurrent radial vessels, neurogenic tumors, and distended bursae can be easily depicted by MRI.